Who has made a greater contribution to the sport of professional wrestling than Calvin Broadus, Jr., the rapper and occasional actor known and beloved internationally as Snoop Dogg? Probably lots of people, but apparently the erstwhile Snoop Lion has done enough cross-promotional appearances at WWE events over the years to earn himself a cannabis-scented spot in the organization’s Hall Of Fame. On April 2, the eve of Wrestlemania 32, Broadus will be inducted into the WWE Hall of Fame alongside such titans of the squared circle as The Fabulous Freebirds, Big Boss Man, and The Godfather in a televised ceremony originating from Dallas’ vaunted American Airlines Center. Though Snoop is ostensibly the first musician to make this particular cut (apparently this doesn’t count), he is far from the only guest celebrity to be enshrined in the WWE Hall of Fame, having been preceded by such famous names as Arnold Schwarzenegger, Mike Tyson, Donald Trump, and Pete Rose. This may seem like a completely arbitrary choice on the WWE’s part, but the truth is that Snoop Dogg’s connections to wrestling run deep. His first cousin, Mercedes Kaestner-Varnado, wrestles professionally under the name Sasha Banks. And Broadus himself has been partnering with the WWE since at least 2008, when he served as a Master of Ceremonies at WrestleMania XXIV. 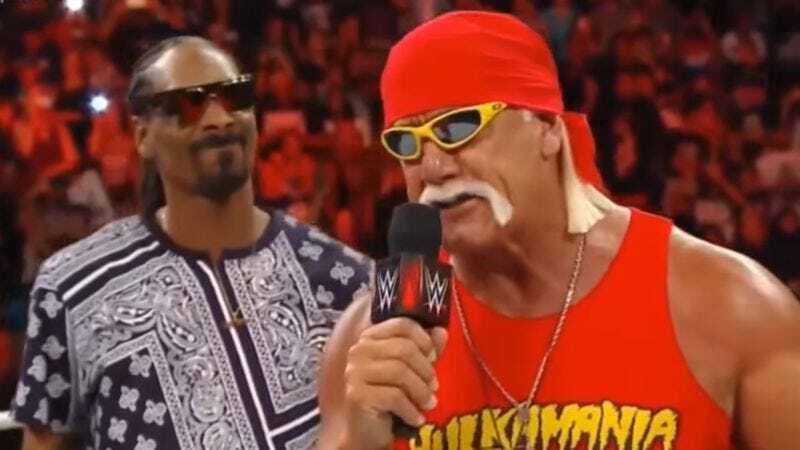 And just last year, Snoop even joined forces with the returning Hulk Hogan to take on Curtis Axel. Snoop undoubtedly has extremely detailed and vivid memories of all of these events, and will be able to expound on them at length when he is inducted on Saturday night. Those who care to watch are advised to watch the ceremony live on on the WWE Network at 8 p.m. ET/5 p.m PT.